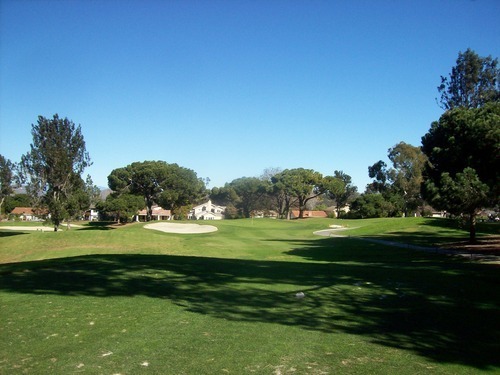 Last week, I was able to wrap up my Los Angeles County public short course list. Saturday, it was San Diego County’s turn. I had four left to play, and though the plan didn’t work out as smoothly as hoped, I still got them all in before the day’s end. This is a city-owned course in a great location, so I just expected it to be ultra busy on a Saturday morning. I called the day before and they were able to slot me into a 6:52 tee time, which worked perfectly for me and eliminated any worries about showing up as a walk-on. Well, I guess there wasn’t too much to worry about. There were a few dawn patrollers out there, but it was pretty easy going. Even by the time I finished and the weather was absolutely gorgeous, there was hardly anyone out there. Two other singles checked in ahead of me and went off on their own first. The first tee was a little awkward as it was kind of “first come, first serve” that early in the morning. By the time it was my turn a twosome was ready behind me and another single walked up, so I asked if he wanted to join me and he did. We never pushed the guys ahead of us and nobody ever pushed us from behind, so it was a nice overall pace of around two hours. The price here for a non-resident was $29 to walk. This is actually a discounted price. Before 9:00 on weekends, you pay the slightly cheaper weekday rate. It still felt a bit expensive, but better than nothing I suppose. Of course, San Diego residents do get a decent discount, so that makes it more appealing for locals. The layout here is pretty straightforward. 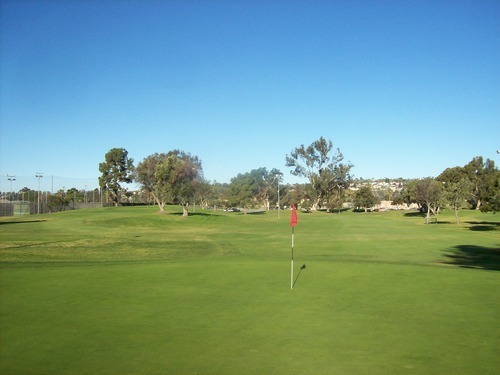 It’s very flat and they kept things fairly simple throughout as an 18-hole executive track (par-58). 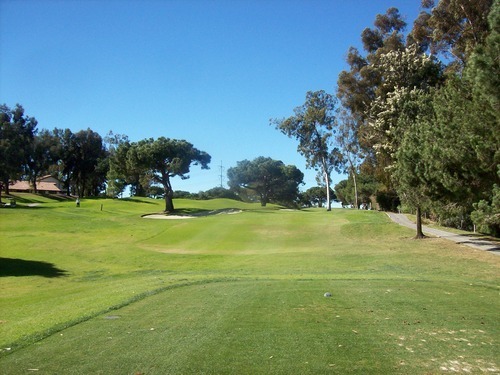 There are four short par-4s (all under 300 yards) and then a mix of par-3s ranging from 75 yards up to 141. 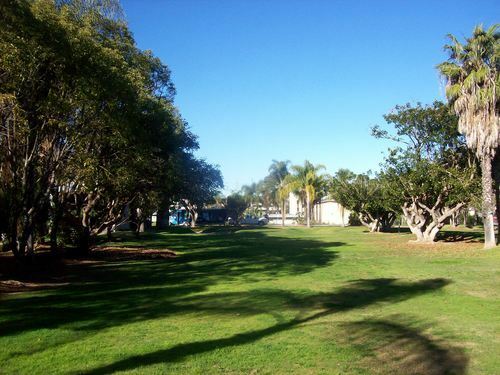 It kind of reminded me of a mini Coronado, but without the great waterfront setting and views. 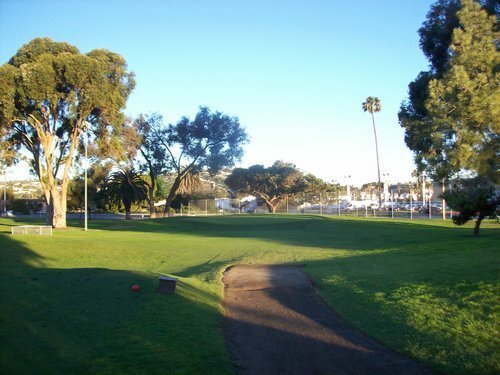 It is right along Mission Bay, but there aren’t really any good views from the course itself. 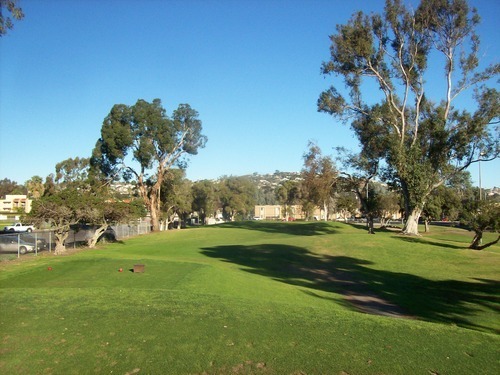 The guy who played with me is a regular here and told me about some of the turbulent history with the course and the neighboring land that is currently a mobile home park. It sounds like the city finally reached a buy-out agreement and some bigger changes may be happening around here in a few years because it’s such prime real estate. Whatever issues they had here seem to be well in the past because the course was in very nice overall shape. I was pleasantly surprised with the conditions, especially in winter. Some tee boxes were a bit beat up, but they were never too bad. 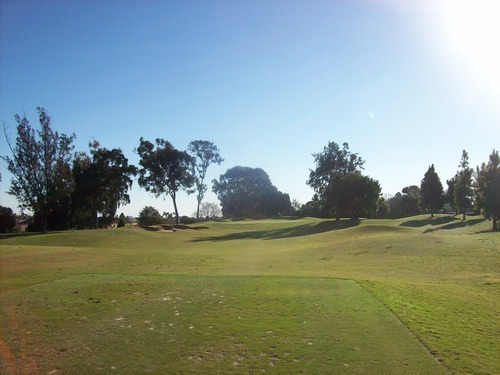 The fairway areas had a mix of grasses (primarily kikuyu with some patches of bermuda mixed in), but were cut consistently and I almost always had nice lies. The rough was not much of a factor and was mostly okay enough. The greens were firm and fairly fast, rolling smooth and true. These were very nice greens overall. I think there are only a couple of bunkers on the course and I was not in one, so no comments there. 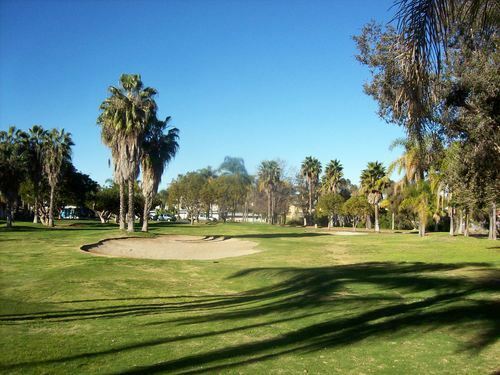 Though not worth driving an hour to play for me, especially paying non-resident rates, I enjoyed my round at Mission Bay. If I lived near here, I could see myself coming out from time to time for a quick and easy round. Also, they do have lights for nighttime play, so that’s another nice feature. From the amount of discarded beer cans and liquor bottles we saw around the tee boxes, though, it may seem the night crowd is a bit more “rowdy” than the morning regulars. 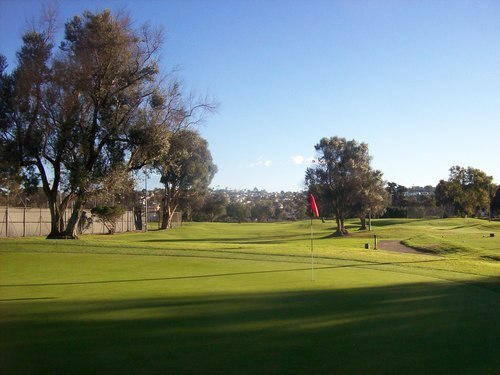 Of all the short courses in San Diego, this one was lowest on my list. 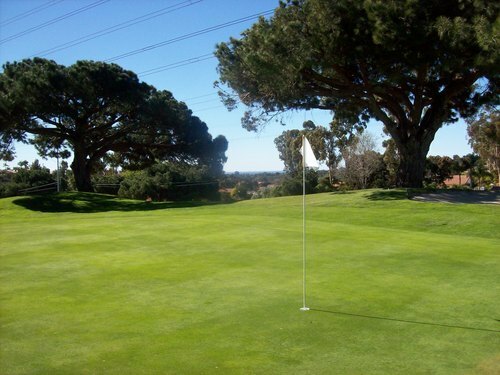 I knew it wouldn’t be anything great, but there are holes in the ground and flagsticks in those holes. So, technically(?) 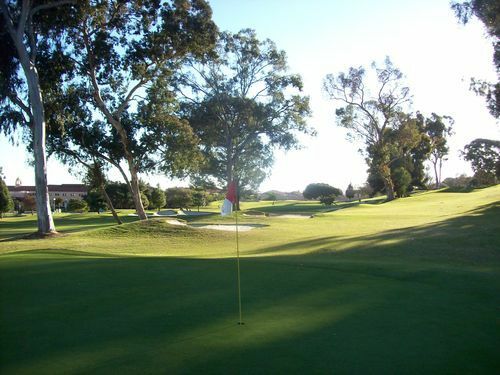 it’s a golf course and I had to put it on my list to play. I got to the hotel and drove around back. 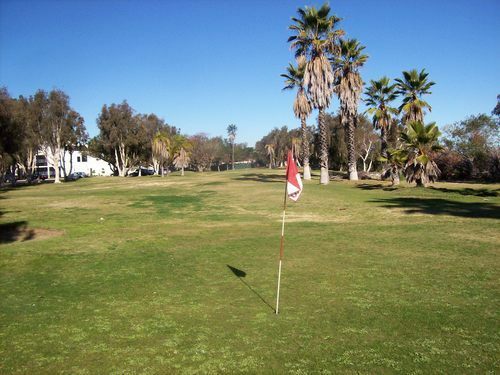 From the satellite picture, I could tell the course was back there and assumed it might have its own little starter shack or at least a public parking area. I saw the course (with nobody on it), but nothing else of note, so I parked in front and went inside to ask. The lady at the information desk pointed me to the Espresso Bar/Pro Shop across the way and told me to go ahead and leave my car parked where it was. I went over there and checked in and paid my $12 as the public guest rate. I don’t know for sure, but I assume hotel guests can play for cheaper or, most likely, it’s just included with the stay. If it’s not, it should be. 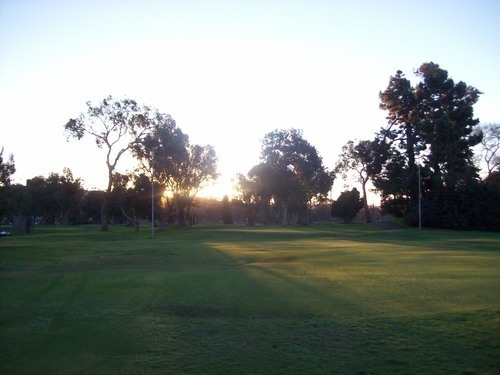 I went back out to my car and grabbed the few clubs I needed after looking at the scorecard. Basically, everything is 100 yards or less and then there’s one listed at 145. 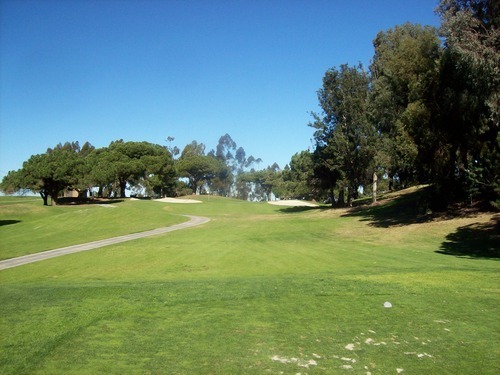 Once out on the course, I mistakenly played the wrong routing. I played hole #1 and then numbers 8 and 9 which are right there and it seems like the natural flow. 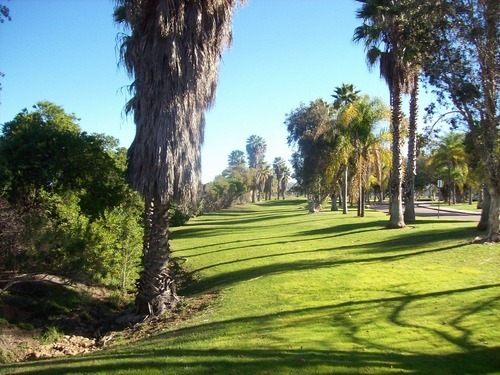 I ultimately figured out my mistake, but it worked in my favor as I played the rest of the course along the east side of the hotel. When I finished the 7th, I was closer to the front parking lot and was able to walk straight to my car from there rather than going back and replaying 8 and 9. As expected, this was a very basic course that won’t hold any interest to even the most novice of golfers. The conditions were not good. Really all that matters on such a simple track is the greens, though. Unfortunately, they were quite awful. They were pretty much equivalent to what is rough on most low-end muni courses. They clearly hadn’t been mowed in awhile and “putting” was pointless. I ended up chipping several times just to mix things up. 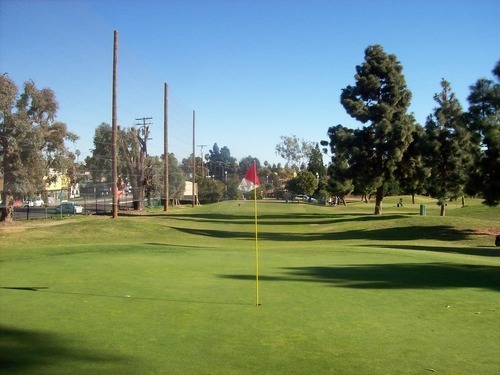 The 145-yard hole (#2) is definitely the most interesting and features a surprisingly narrow tee shot with a fence/OB left and trees along the right. 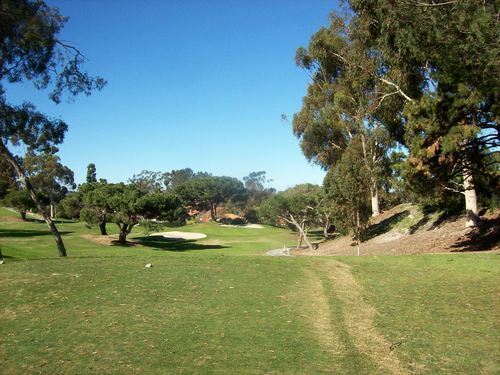 It is quite a tough hole for such a basic and dumpy little course. The Four Points seemed like a pretty nice hotel and you might think they’d take a little better care of the course as a guest amenity. Obviously, nobody else was out there playing, so it probably doesn’t ever see much action. From what I saw and experienced, I’m surprised they put in any effort to keep it open it at all. By the time I finished at Four Points, my friend had texted me to let me know he couldn’t make it. No big deal, so I headed back toward The Loma Club on my own. Because it’s further north, I planned to play here last on the way back home. I made my way up there and it was also pretty busy out. 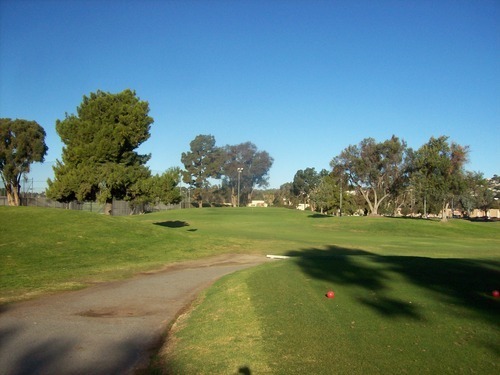 However, I had no problem getting on and teeing off around 10:45. I joined up with another twosome on the first tee and that made things a lot more enjoyable compared to playing by myself behind a bunch of slow groups. The price here was also $29, which again felt too steep. 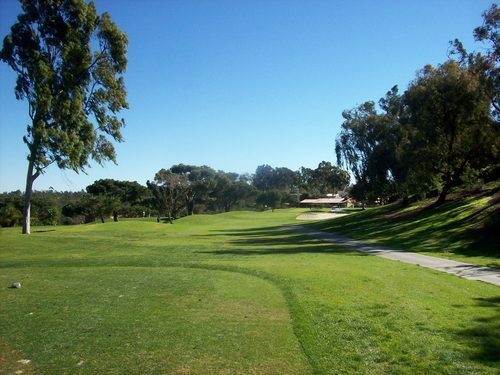 I then also shelled out an extra $10 for a cart once I saw how crowded the course was. Ultimately, it was worth it because I had a comfortable, shaded place to sit while waiting on each tee box. The pace was pretty slow, but not terrible, and we finished in about 2 hours, 45 minutes. 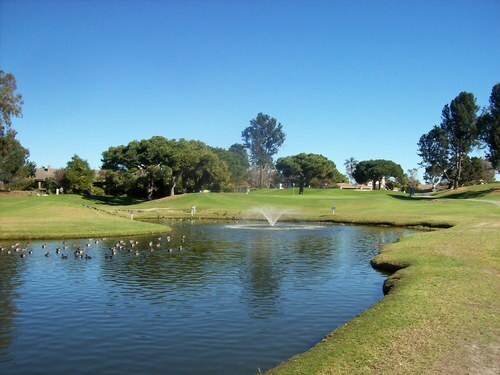 Lomas Santa Fe is the executive little brother of Lomas Santa Fe Country Club right next door. That one is private, but the executive course is fully public. 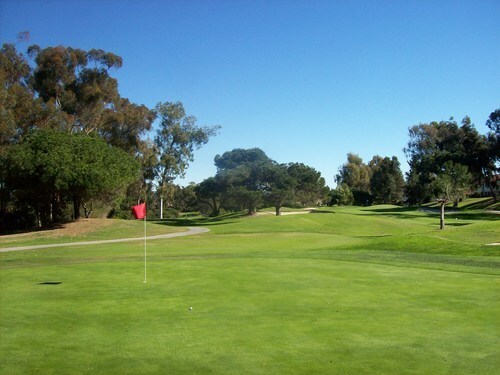 It’s a par-56, 18-hole course with only two really short par-4s. The par-3s range from 90 yards up to 169, but most fall within the shorter end of that spectrum. 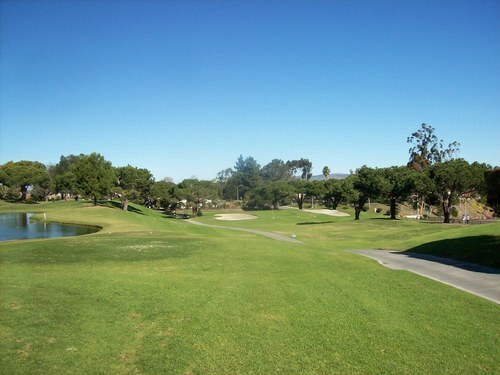 The course is relatively hilly with most holes either playing slightly uphill or downhill from tee to green. 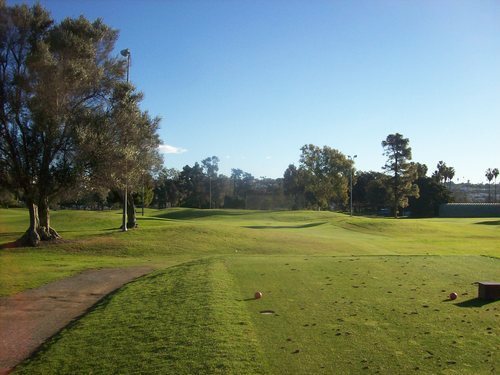 The shortest holes tend to be uphill and the longer ones are all downhill, so it all kind of evens out with a lot of similar-distance shots. 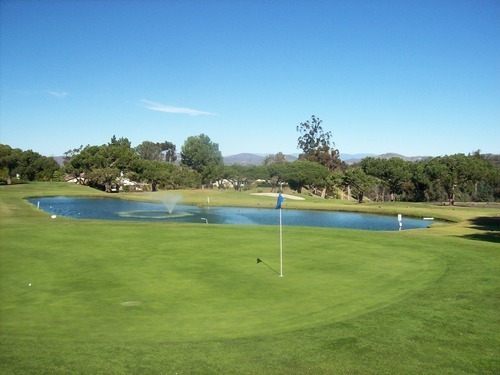 With the hilly terrain and pretty nice setting (you do get one brief ocean view on the 8th hole), Lomas Santa Fe is definitely one of the more fun and interesting short courses around. It’s not very difficult, but offers enough to keep you entertained. The greens have some slight slopes and undulations, and there are plenty of bunkers in play to add some challenge. 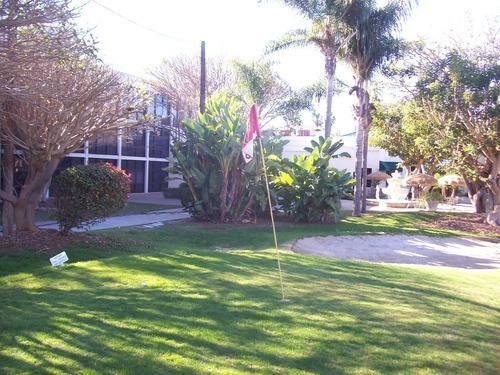 There are two water hazards and some OB areas on the outer edges of the property, as well. 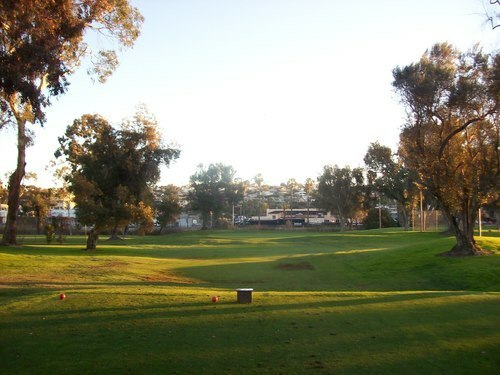 This course was also in pretty nice winter shape. The tees were mostly fine. It’s clear they move the markers regularly and then sand over the old divoted sections, so that is the right way for a course like this to do it! The fairways on the two short par-4s were decent. The rough was mostly pretty lush and green throughout. The greens were pretty nice, too, rolling at medium speeds. With a lot of wind here on Saturday, there was a lot of debris blowing around on the greens, but that’s life on a windy day. I was in a couple of bunkers and they had good, soft sand. 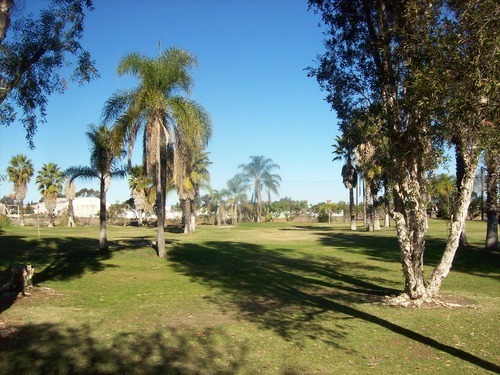 Though a bit pricy for a short executive, the conditions and layout of Lomas Santa Fe Executive provided a lot to like. 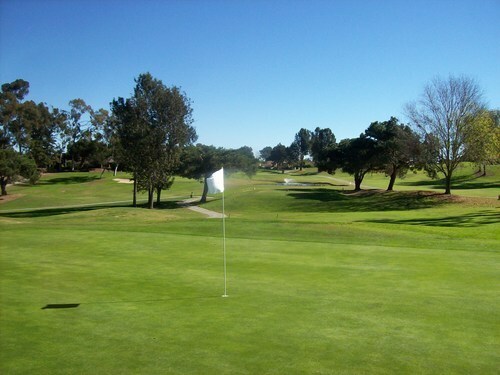 After finishing at Lomas Santa Fe, I called over to The Loma Club and they let me know it was still very busy out with not much available until 3:20. However, I went down there anyway to take my chances. 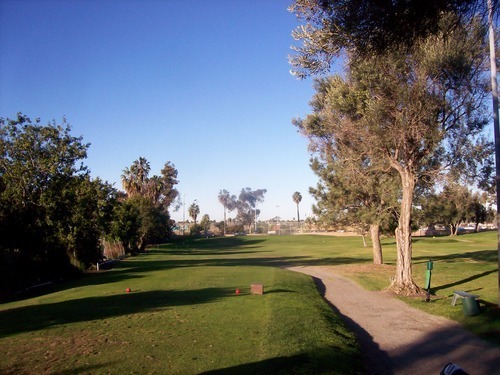 With this being the last stinking course on my list, I was determined to play it Saturday! 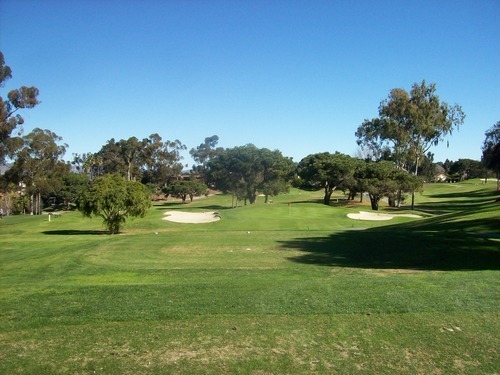 In case this name doesn’t sound super familiar to my San Diego readers, this course was formerly known as Sail Ho. It seems they’ve done some renovations around here and went with a rebranding of the course. They have a nice bar in with the pro shop and a fancy wine bar/store and restaurant with patio dining all right there, so it’s kind of a trendy local hangout it seems. I ended up getting to go off by myself around 2:30 behind a logjam of groups and in front of a huge family group of 11 people! The price was $15. While I was waiting on the 2nd tee, another single came out and joined me. That ultimately made things much more bearable on such a slow day. There was always at least one group (sometimes two or three) waiting on each tee box. 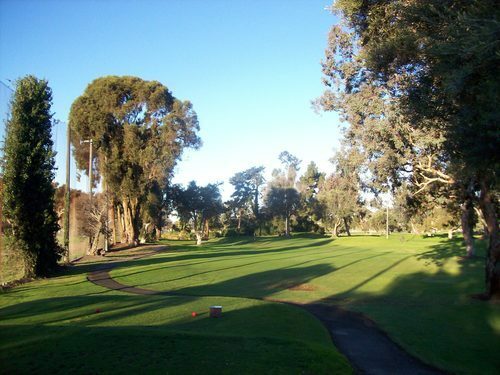 No 9-hole par-3 course should ever take two hours to play, but The Loma Club did on this day. My playing partner was a regular here and said he’s never seen it so crowded, so it may have just been an unusually busy day because that morning tournament backed everyone up. As mentioned, this is just a par-3 course and it has kind of an odd selection of hole lengths with big gaps in distances. Four of the holes are well under 100 yards. Then one is 110. Then there are two more in the 150-ish range. 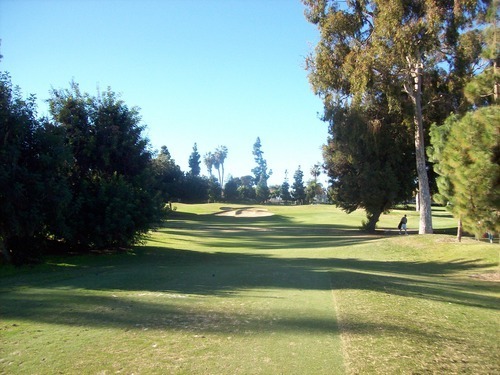 Then there are two pretty beefy holes (numbers 7 and 8) at 203 yards and 183 yards respectively. 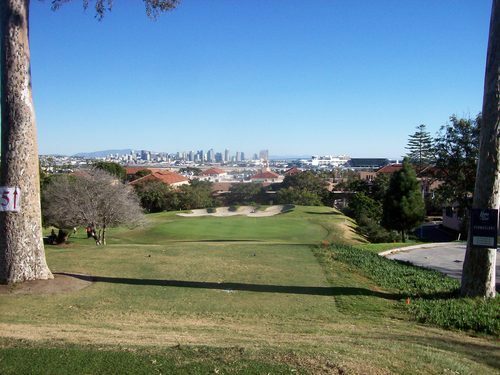 The highlight hole at The Loma Club is the 5th, which features one of the best views found on any San Diego course not named Torrey Pines. 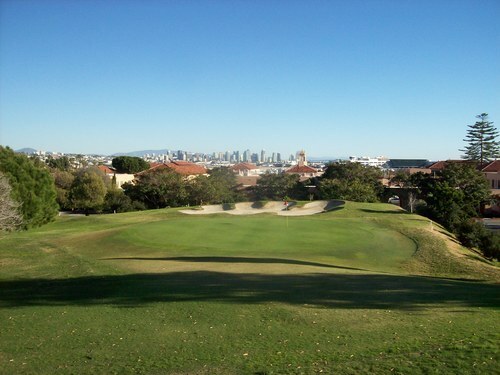 It’s a very short downhill hole (77 yards, but only plays like 40 or 50) that has a perfect vista of downtown San Diego. The airport sits between the course and the city, so you get a great unobstructed view and the occasional plane taking off. It’s a very cool little spot that makes this course a lot more memorable than it should be otherwise. As far as conditions went, the course played better than it looked in places. The turf here is primarily bermuda, so it was very tight and dormant throughout. Some of the tee boxes were okay and some were terrible. A few even had big swatches of astroturf down instead. 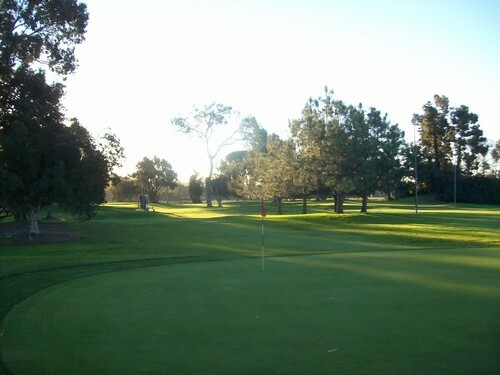 The greens were the highlight, though, as those were in very nice shape overall and rolling smooth at medium speeds. I wasn’t in a bunker, but there are plenty of them here and most have a nice visual look. From what I could see, most looked to have decent sand coverage, but a few looked kind of firm and crunchy. 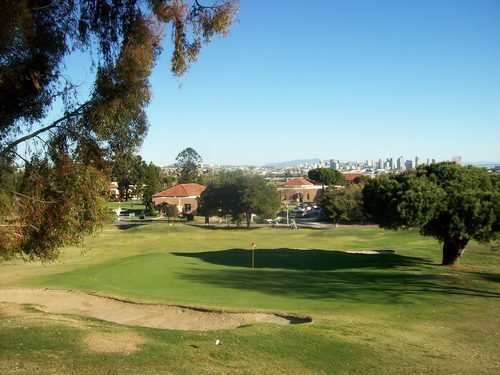 The Loma Club is a pretty fun course with a great location, so I can see why it’s a popular. There were a lot of families out there with little kids, grandmas and grandpas, so it’s a course that caters perfectly to a novice crowd. Still, even us more “serious” players can have a pretty good time here.